This page details how to install shrink-to-fit plastic wrap over existing windows. The use of plastic heat-shrink window coverings is an easy, effective, and inexpensive window option. Use the information below to determine if this project is a good fit for your home, what common problems it can help address, what the potential benefits are, what tools and materials you’ll need to complete the project if you choose to do it yourself, important safety considerations, step-by-step instructions for getting the job done and when to seek professional assistance. Locating air leaks can be tricky, as they are often very small and barely noticeable. There are several quick and easy do-it-yourself (DIY) ways to locate leaks. 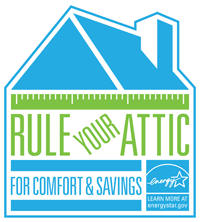 Your local utility may offer rebates for a professional home energy assessment and certain air sealing and insulation projects. Leaks around windows can lead to uncomfortable drafts and energy losses. While these projects may have less impact on energy use than those in the attic and basement, they tend to be the more accessible areas and are perfect for a do-it-yourself project. Window film covers are inexpensive, reduce drafts, help the house feel warmer during winter months, and reduce moisture buildup on the window due to condensation. They can also eliminate air leaks around the window if they extend over the woodwork, and this extra layer of plastic adds another layer of insulating air to reduce heat loss through the window. If you prefer simpler home improvement projects, applying plastic over windows may be a good DIY project for you. Kits are available in several sizes at home improvement, hardware, and discount stores. The plastic film comes in window-sized pieces in the kits; purchase a kit that fits the width of your window. When winter is over, take down the plastic and pull the tape off the trim. The tape removes easily without damaging the finish. Consult the instructions on the box. Properly size the film, leaving a few inches on either side. Clean the window frame before applying the film. Apply the adhesive and then film, using the hair dryer to tighten the film. Remove the rotating wand from the blinds before you apply the shrink film. To unhook the wand, lift the retaining ring (if any) and lift the wand off the hook. Apply the window film and shrink it in place, as described in the step-by-step guide above. 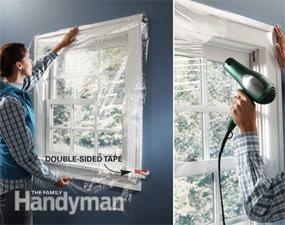 Apply four strips of cellophane tape to the window film surrounding the wand hook. Overlap each strip at the corners so they reinforce each other. Cut out the center of the square with a new utility blade (a dull blade will rip the film). Install the wand and pull out the lift cords.